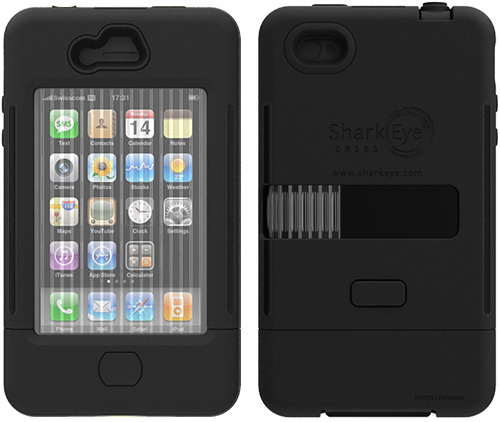 SharkEye Rugged iPhone Case Features A Sliding Screen Door | OhGizmo! Most iPhone cases, even those purporting to be rugged, still have one weak spot. Since it’s a touchscreen device they always leave the screen exposed, meaning there’s still a chance your phone could get damaged. But the rugged cases from a company called SharkEye are the first I’ve encountered that also protect the display. Instead of just using a clear screen protector though, their cases feature a sliding frosted door inspired by a shark’s nictitating membrane. It of course means you can’t use the touchscreen while the door is closed, but you can at least see who’s calling or what track is playing. And like other rugged cases, the SharkEye features a hard plastic outer shell combined with a soft elastomer inner-lining to absorb most of the impact force of a dropped iPhone without damaging the hardware inside. And given the ports are all protected with easily removable rubber plugs, I’m going to assume the SharkEye is at least splashproof or water-resistant. $49.95 available for both the AT&T and Verizon versions of the iPhone 4. ← DryShot Fire Extinguishing Gun – Do You Feel Lucky? Well, Do Ya, Fire? Cool idea, but personally I’d be seriously annoyed if every. single. time. i wanted to check my phone I’d had to slide a screen. thanks for the review) very interesting and helpful!